The Pink Floyd line “we don’t need no education” might hold true for some musicians, but for others that couldn’t be further from the truth. The musicians highlighted below didn’t just swing by a university to pick up an honorary diploma only after finding musical success. Nope, they put in the long hours to earn doctoral degrees and then picked up jobs with outfits such as NASA and the U.S. Department of Defense. Because as cool as having “rock star” on your Wikipedia page is, having “rocket scientist” follow it is just that much cooler. 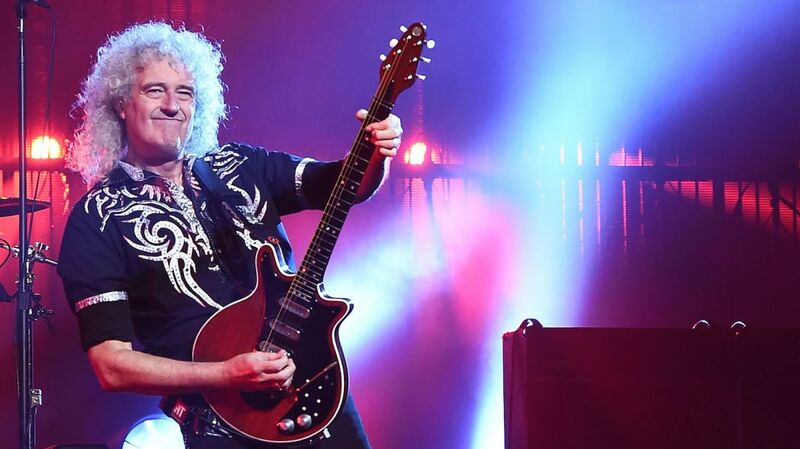 British guitarist Brian May could have easily called it a day when Queen’s recording career came to an end following the death of Freddie Mercury in 1991. While May continues to play live with his remaining bandmates, he has also embraced his interest in astrophysics. Punk rockers the Descendents weren’t joking around when they named their first album: 1982’s Milo Goes To College. Frontman Milo Aukerman put all those punk rock lyrics about binging on coffee to serious use, earning a doctorate in biology from UC San Diego and a PhD in biochemistry from the University of Wisconsin-Madison. Orange County, California punk rockers The Offspring have been regularly touring and putting out albums since the mid-1980s. What fans might be surprised to learn though is that in between writing songs like “Pretty Fly (For a White Guy),” the band's lyricist and frontman Dexter Holland was working on HIV research. In May 2017, Holland earned his PhD in molecular biology from the University of Southern California, completing a 175-page dissertation titled Discovery of Mature MicroRNA Sequences within the Protein-Coding Regions of Global HIV-1 Genomes: Predictions of Novel Mechanisms for Viral Infection and Pathogenicity. Lengthy scientific jargon thesis titles aside, Holland told Rolling Stone his focus was on the molecular dynamics of the HIV virus. "I am interested in virology and wanted to contribute in some small way to the knowledge which has been learned about HIV and AIDS,” Holland said. People fall into side gigs like dog-walking or crafting all the time. Finding yourself unexpectedly taking on a second job as a consultant in missile defense systems, on the other hand, is a little more out of the norm. Jeff “Skunk” Baxter spent much of the 1970s and '80s playing guitar with acts like the Doobie Brothers, Steely Dan, and Elton John. Since the mid-1990s though, Baxter has had a second job working with the Congressional Advisory Board on Missile Defense and consulting for General Atomics. And he landed those gigs almost entirely out of sheer luck. Baxter credits his natural curiosity to look at technologies and how they can be improved upon as his springboard into the field of missile defense. The guitarist would regularly pick the brain of his next door neighbor, a retired engineer who had worked on the Pentagon's Sidewinder missile program. Baxter spent the next several years doing his own research and learning everything he could about the hardware developed for missile use. He would eventually submit his own proposal on how to improve the ship-based Aegis missile system to California Republican congressman Dana Rohrabacher and the rest is history. For more than three decades, Bad Religion has held a spot as one of the most respected punk bands in the genre, with vocalist Greg Graffin commanding the stage. Graffin’s politically-charged lyrics have helped the band maintain a healthy following, but music isn’t Graffin’s only passion. Since 2008, Graffin has split his time between playing with Bad Religion and teaching evolutionary biology at several universities. Graffin earned a PhD in zoology from Cornell University and has returned to his alma mater to teach courses on the subject. The punk rocker has co-authored three books on the subject of evolution and religion and taught life science courses at the University of California Los Angeles. Like other musicians who dabble in the sciences, Graffin has found parallels in the two. “If I’m behind a lectern or onstage, I’m just trying to provoke people to use and expand their minds a little,” Graffin told the San Diego Tribune. The life of Philip Taylor Kramer was one filled with both exceptional success and horrific tragedy. Kramer first made a name for himself in the 1970s playing bass with psychedelic rock band Iron Butterfly. He went on to play with other groups into the early 1980s, but would later leave music and find success in the field of computer engineering. The musician’s father was a professor of electrical engineering and after a career in music, Kramer co-founded a company that produced significant work in missile guidance systems as well as computerized facial reconstruction models. Tragically, Kramer’s life was mysteriously cut short in 1995 when he disappeared after making a frantic call to his wife from the Los Angeles International Airport and telling her to meet him at a hotel. The musician/computer engineer then called the police and said he was going to kill himself before abruptly hanging up. He wasn’t heard from again until his burned-out van was discovered in the bottom of a ravine four years later. The death was ruled a probable suicide, though some of Kramer’s closest family and friends suspected foul play. Deadheads will probably best know the name John Perry Barlow from the liner notes of Grateful Dead albums as a co-writer on a number of classics like “Mexicali Blues” and “Cassidy.” Further exploration would reveal that there are many sides to John Perry Barlow besides Grateful Dead lyricist. Barlow can be credited as a pioneer in the digital revolution, leading the way to preserve and protect internet freedoms as a co-founder of the Electronic Frontier Foundation in 1990. These days Barlow has shifted his focus to a new calling—pond scum. More specifically: algae. He is the vice president of Algae Systems, a company working to grow microalgae as a biofuel and convert sewage into a fertilizer. Rock band Boston had one of the best-selling debut albums in music history with their 1976 self-titled debut selling 17 million copies. Almost all of that success can be attributed to guitarist Tom Scholz’s background as a mechanical engineer. Scholz had received both his bachelor's (1969) and master's degrees (1970) in mechanical engineering from the Massachusetts Institute of Technology, but he had dreams of rock n’ roll stardom. To pay the bills, Scholz took a job as a senior product design engineer at Polaroid. The young guitarist and engineer spent his paychecks and nights building his own basement recording studio and creating nearly every sound, except for the vocals and drums, of what would be Boston’s debut album. The DIY process was unheard of at the time and Epic, the band's record company, demanded that the demos be redone in a proper studio. Scholz refused to budge with nearly all of his original recordings eventually making it onto the highly-successful album.